826NYC Writing Program, Superhero Supply Co.
Next week, our month-long spotlight on Park Slope will come to an end. We've already shared our favorite places to play, eat, learn and shop, but we couldn't wrap up our coverage without telling you about one of the coolest, most offbeat and unique destinations in the neighborhood: Brooklyn Superhero Supply Co, a little shop with an amazing alter ego. While Park Slope families may be well aware of this spot's double identity, we're guessing lots of readers have never even heard of this shop, let alone know its big secret. Find out what's going on behind a hidden door at this store for aspiring Spider-men and Wonder Women. Brooklyn Superhero Supply Co. is exactly what it sounds like: an emporium for caped crusaders. 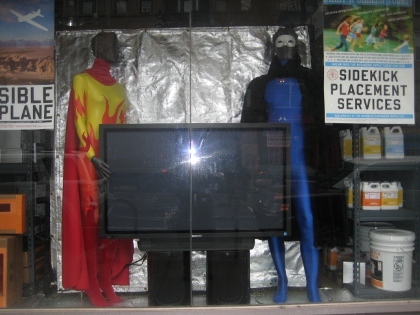 The store sells everything superheroes need, like colorful capes, tights and masks; secret identity kits; gizmos and doohickeys for their secret lairs; invisibility suits; cans of Immortality, Truth Serum and Anti-Gravity; and even muscles! The shop also offers an assortment of rock star sunglasses, super balls and other tchotchkes in case you aren't in the market for a gallon of Mind Control. Superhero-obsessed kids will love it here, especially if they're still young enough to believe that Superman really exists. When you go to check out, kids are asked to create a superhero alias (my son is Lighting Man) and to take the superhero oath before the order is completed. Kids love placing their items in the vault (a.k.a. a dumbwaiter) and watching as they are lifted to the cashier, who sits in an elevated booth. Once she rings it all up, she sends your purchases back down along with your change. The whole experience is very special and secretive—the staff even deters visitors from taking photos (because secret identities shouldn't be revealed, you know). Brooklyn Superhero Supply Co. also has another purpose tucked away behind a hidden door: 826NYC, a not-for-profit writing center that offers free classes to children ages 6 to 18. 826NYC is part of 826 National, an organization founded by well known author Dave Eggers and veteran educator Ninive Calegari back in 2002, which has centers all over the country. The Brooklyn branch provides drop-in tutoring and writing workshops led by publishing pros and teachers at no cost. Parents need to fill out a registration form before a child can participate. When kids drop in, they should bring homework or a writing project to work on—as it says on the site, 826NYC isn't a child care center. During the first-come, first-served sessions, students work one-on-one with a tutor. If they have extra time, they can read or work on an independent writing project. Weekends and after school. Visit the website for a complete schedule. These free classes help students as young as 6 strengthen their writing skills. They're extremely popular, which is why enrollment is determined by lottery. The next scheduled workshop is Publish the Greatest Story Never Told, in which high schoolers can share their own NYC tales. It runs for five consecutive Sundays beginning January 29, and at the end, the stories will be published and bound. The program is free but there is a $50 registration fee that will be refunded to students who attend all of the sessions. 826NYC also offers in-school writing support for middle and high school students. For elementary schools, there's storytelling and bookmaking field trips to the center. You may be wondering what's with all the superhero stuff. Well, when Eggers and Calegari set out to open their first center in San Francisco, they discovered the spot they picked was zoned for retail, so they opened up a Pirate Supply Store with a writing center in the rear. The model worked and since then they've rolled out seven other extraordinary shopping experiences as fronts for writing centers. In addition to the Pirate Supply Store and Brooklyn Superhero Supply Co., there's Boston's Bigfoot Research Institute, Chicago's The Boring Store and Los Angeles' Time Travel Mart, to name a few. Proceeds from the stores help fund the writing centers, plus they're fabulous marketing tools. If you plan to visit Brooklyn Superhero Supply Co. or try 826NYC's drop-in tutoring sessions, call ahead! The store and the center are staffed entirely by volunteers so hours sometimes change. See more of our posts about Park Slope.